USA Football announces 11 youth football leagues spanning nine states to pilot Rookie Tackle — a bridge game between flag football and 11-player tackle. Rookie Tackle, a bridge game between flag football and 11-player tackle, is designed to introduce young athletes to tackle football. In alignment with the U.S. Olympic Committee’s American Development Model (ADM), USA Football will pilot Rookie Tackle this fall as part of a long-term athlete development pathway in the sport. A fun, skill-development-centric version of the game for young athletes, Rookie Tackle will be evaluated throughout an 11-league pilot season. This version of football delivers a progression practiced in a variety of sports, including tee-ball to “coach pitch” to “player pitch” in baseball. A key outcome of the pilot is to learn how players, parents, coaches and youth league commissioners embrace its concept and how it may be improved for a wider spectrum of youth sports programs in future seasons. Youth players’ physical activity also will be measured to gauge fitness benefits specific to the small-sided game. Similar versions of the sport have been played in some youth leagues for years. USA Football continues its commitment to innovative new standards by introducing the USOC’s ADM to football through Rookie Tackle, joining a family of initiatives including Heads Up Football, which advances coaching education and safer play in high schools and youth leagues nationwide. “It’s a game that teaches so much, it’s a great education, it’s a stepping stone, it’s a transition to 11-player football and I can’t think of a better game that does it,” said USA Football Master Trainer and National High School Hall of Fame football coach Chuck Kyle. Kyle, the head football coach at Cleveland St. Ignatius High School, also serves as the Cleveland Browns’ youth football advisor. Kyle has helped the Browns become the first NFL team to assist USA Football in establishing a Rookie Tackle pilot league. 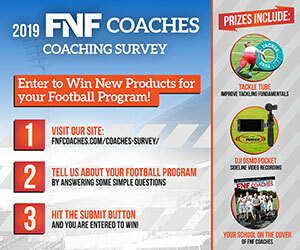 The June Edition of FNF Coaches Is Live!